When we are going to design the Combustion Chamber of a diesel engine the main consideration we have to keep in mind is high compression ratio & sufficient turbulence of air. For high compression ratios, overhead valves are more preferred than side valves in automobile engineering. For moderate & low-speed engines this type of chamber is most suitable. The fuel is injected directly into the combustion chamber, which is formed by a part of the piston. Where it penetrates the mass of hot compressed air. The injector pressure is more than 21 kilogram per centimeter square is used. The fuel injector is placed in the center of the chamber and contains more than four orifices. Due to the location of orifices, the spray pattern suits the chamber & does not impinge on the wall of the cylinder or piston. This design is used by Leyland Motors Ltd has the chamber in the form of a truncated cone. And the fuel injector is located near the circumference of the chamber. In some engines, two injectors are located on the opposite side of the chamber. 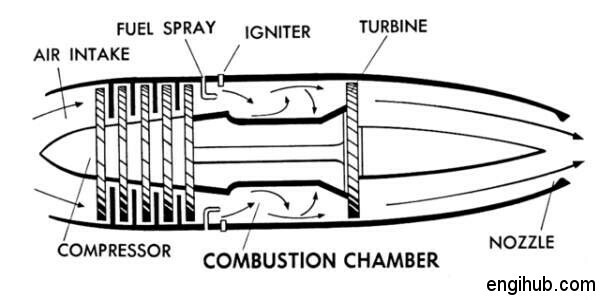 The open type of combustion chamber depends upon the primary turbulence as the main source of air movement due to which engine can start in cold condition and don’t required heater plug. In small high-speed engines, this type of chamber is mostly used. Total fuel is directly fed into an auxiliary combustion chamber where the initial combustion takes place. Due to rise in pressure, the partially burnt mixture is forced at high velocity through a small orifice into the main chamber. Where the rest of the combustion aided by secondary turbulence takes place. As the piston descends during the power stroke, the pressure difference created between the precombustion chamber and the main chamber. This assists in discharging the hot exhaust gases from the precombustion chamber. This type of combustion chamber has a very low maintenance cost due to low injection pressure and simpler single nozzle orifice. The main chamber is subjected to less pressure since the pressure shock is mainly taken by the pre-combustion chamber. This type of combustion chamber gives clean exhaust. But heat losses are higher due to a large surface area of two chambers. In some designs, a small chamber is provided which is called an air cell. They are away from the fuel spray nozzle. This is so located that the fuel is sprayed near the narrow neck. This connects the air cell to the main combustion chamber. The piston compresses the air during a compression stroke and pushes it into air cell. As the piston moves down the pressure in the cylinder falls resulting in the flow of hot air from the cell into the chamber producing the secondary turbulence, which mixes the air & fuel further and completes the combustion. The air cell also requires a high compression ratio and heater plugs for starting. The heat losses are more due to large wall area. This combustion chamber is separated from the cylinder and one of the most efficient combustion chamber. In this type, chamber air enters in tangential direction during a compression stroke and imparts a rotary motion. The fuel is then injected into the hot compressed air and the combustion takes place. Reversal of flow takes place due to pressure rise. Hence the hot gases are discharged into the cylinder pushing the piston upward in working stroke. Due to the higher temperature of air in the combustion chamber, fuel of low ignition quality can also be burnt satisfactorily. It is also called as Lanoxa chamber and works on combined principles of air cell & auxiliary combustion chamber. As fuel injector sprays the fuel, 10% of fuel passes across the combustion chamber & enters an energy cell. The combustion generally starts in the main chamber, spread to the energy cell where pressure rises considerably. Due to the pressure difference between the energy cell & main combustion chamber, the hot gases from the minor cell will sweep the fuel from the minor cell, into the combustion chamber where additional turbulence is set up to ensure complete combustion of fuel. A restricted opening can be closed by a plunger, which connects major cell with the minor cell. Once the engine is started the restricted opening can be opened out. So, the minor cell is connected to the major cell. Through a small opening, minor cell communicates with a combustion chamber. Due to this small opening, the hot gases are throttled. And so the pressure rise in the main combustion chamber is gradual. The air has the highest temperature in the main combustion chamber where the fuel is sprayed direct resulting in complete combustion. Governing: How to Govern Internal Combustion Engines?